A yellow sapphire gemstone is not only one of the most exotic possessions but also one of the most care-seeking ones. Even though the stone ranks 9 on the Moh’s scale of hardness, depicting its strength and immaculate durability, there are a few cautions that you must exercise to help the stone keep looking like new. In case you own a yellow sapphire engagement ring, then here are some dos and don’ts that you must practice for taking the best possible care for yellow sapphire rings. Always remember to keep the ring clean. With time, the gemstone on your ring may lose its sheen due to dirt, gunk, and grime. To help it keep looking like new, clean it regularly or get it cleaned by a professional jeweler. A regular examination of your engagement ring from a renowned jeweler will help you check for any issues that may arise in the long term. This will also help you set the stone properly, making it secure. Freely wear your ring to work and enjoy the feel of exquisiteness that it provides. Unless your workplace is unsafe for valuable items, you have all the freedom to flaunt it with grace and confidence. Every piece of jewelry that you buy has some sort of emotion attached to it. And your engagement ring has all the more emotional value attached to it, thanks to the love and bond that it represents. So, ensure you respect your ring and maintain it in the right manner. Thanks to the durability of yellow sapphires, they are great to be worn during the night even when you sleep. In case you might get swelling from the ring, then avoid wearing it to bed, otherwise wear it without any worries. The metal of the ring may lose its sheen gradually. So, repolishing the ring makes absolute sense when it comes to taking care of your yellow sapphire engagement ring. Maintaining the ring well requires a lot of precautions. Don’t wear your ring when you bathe, swim or clean as it may damage the gleam of the ring and the gemstone due to chemicals found in soaps, swimming pools, and cleaning materials, etc. Engaging in activities that may harm the ring should be simply avoided. There is no denying that sports and other adventurous activities give a great adrenaline rush, but caring for your ring becomes difficult when you are too busy to enjoy yourself in such activities. This means you can easily damage your ring by dropping it or getting it hit. Activities like these may seem harmless, but they may cause a detrimental effect on the gemstone, and it might get loose or cracked, without you even knowing about it. There are people who would place their engagement rings in the beautiful box that came with the ring. Don’t be one of them. Wear your ring and show it off to all those you want to. Enjoy the feel of being a proud owner of a stunning yellow sapphire ring that’s been gifted with love. Cleaning the ring is important but making sure that it is done in the right manner is equally important. 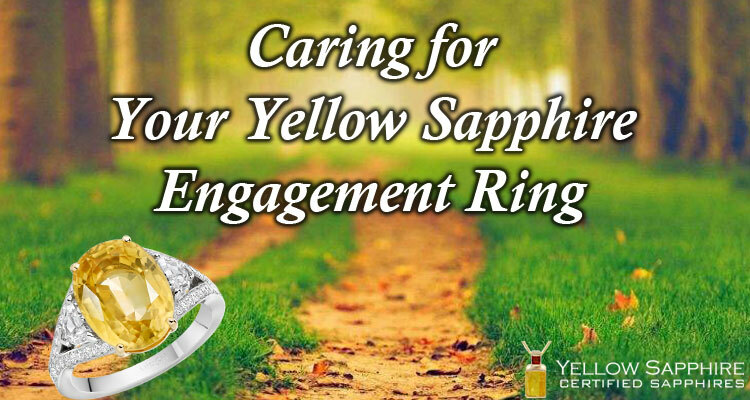 Don’t use abrasive materials and harsh chemicals that may damage the ring, especially the yellow sapphire gem.